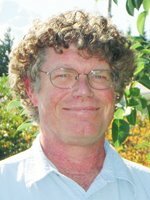 Oregon State University has hired tree fruit entomologist Dr. Peter Shearer as superintendent of the Mid-Columbia Agricultural Research and Extension Center (MCAREC) in Hood River, Ore. Before starting work for OSU, he was a tree fruit entomologist for Rutgers University in his native state of New Jersey, but he has past Oregon connections as well. He earned his master’s degree from OSU, and from 1982-1991, he was a research technician at MCAREC. Shearer plans to work on research to develop ways to kill fruit orchard insect pests, such as codling moth larvae, without also taking out beneficials, such as ladybugs and predatory mites, in the process. He will also develop a vision for the center. “We want to do innovative, forward-thinking research,” he said. “What I’d like to do is develop a plan that would take us into the future. We’re trying to figure out where we’re going to be in 20 to 30 years. When you’re working with orchards, they’re in the ground for a long time, so you have to think far ahead.” For more, watch for the Oregon State University press release (not yet available online; please check back).